The latest update to Android Wear is rolling out in the Google Play Store, bringing with it improved connectivity between your watch and your phone. The updated build is version 1.5 for those keeping score at home and the new feature essentially takes the Wear app and allows you to turn off the battery optimization so your phone communicates with your watch on a more consistent basis. In other words, it forces the app to stay connected to your watch even if your phone is in Doze mode. One of the great features of Android Marshmallow is Doze which, if you don’t know what that is, puts your phone and its apps to sleep when your phone is sitting still and not plugged in charging. The idea is that it will save battery life and generally speaking, it does that and does it well. 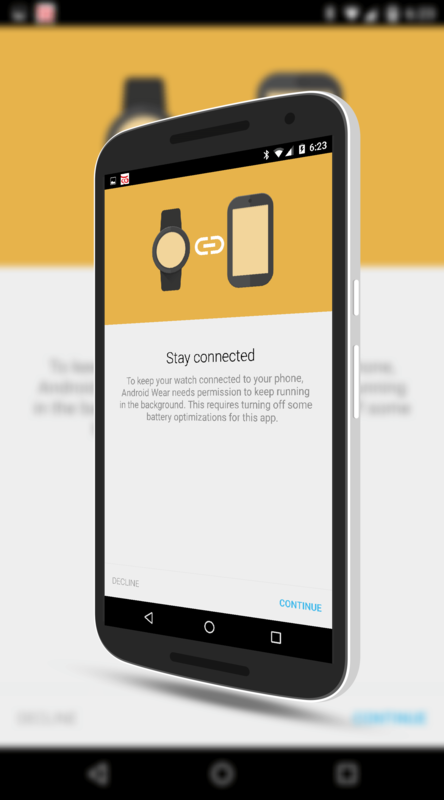 The problem with Doze in Marshmallow is that it sleep apps that are genuinely important, like Android Wear. If your phone goes into Doze mode, you will find that often your watch and phone quit communicating. You’ll know this by either the cancelled cloud icon on your watch or when you pick up your phone again, you will get a notification that Android Wear is connected again. The reason for this is that the Wear app is taking care of things like voice searches and replies you make in Hangouts or another supported app. If the app goes to sleep, those kinds of things just don’t work or unreliably at best. That is where this updated version of the app comes into play. When you first start the app, it will give you a blue box at the top of the app that lets you know if you want to keep your watch connected, you need to allow the app to run in the background. If you want to do this, tap the Stay Connected button where you are brought to a page that explaining that in order for your watch and phone to stay connected, you need to give the app permission to run in the background. What this does is take it out of the scope of Doze in Marshmallow. The app also warns you that this change will turn off optimization features for Android Wear which will impact battery life. If you are okay with all that, tap Continue and you will get a dialog box that says “Ignore battery optimizations?” to which you will tap Yes to enable. If you do this, you can then go to Settings>Battery and use the menu to view Battery Optimization. You will now see that Android Wear is no longer optimized and will run all the time. If you want to change this, just tap on the Android Wear app and then chose Optimize and it will return back to the default, saving you a little bit of battery life on your phone. So do you really need to do this? If you like using Google voice search or replying to messages by voice, then yes. This will assure that you can do these activities without having to touch your dozing phone. If squeezing every last drop of battery life out of your phone is more important, then no. Don’t enable it. That said, I’ve had this feature enabled all day today and have not seen any appreciable battery life drop. Look for the update to come to your phone over the course of the next few days as it rolls out in the Store.